PHUKET: A novice monk who was walking collecting alms on Saturday morning was lucky to escape uninjured when an out-of-control car ploughed into parked motorbikes close to where he was walking forcing him to run for cover to avoid being hit. 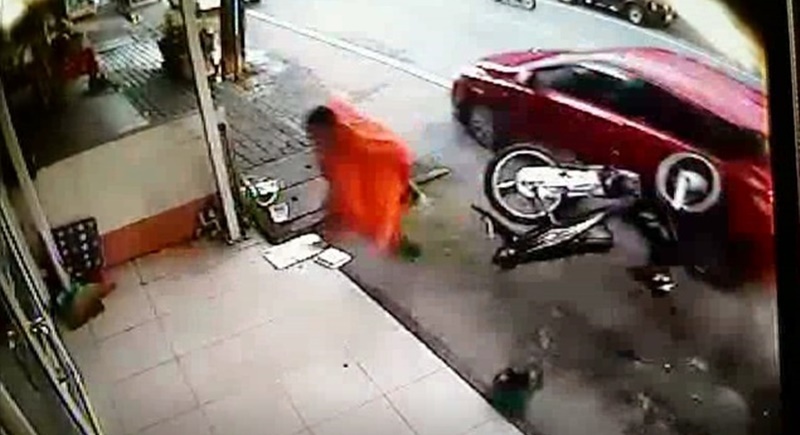 Yesterday (June 26), CCTV footage from in front of a shop near the Cherng Talay fresh market in Thalang shows a novice monk narrowly escape injury after a car runs into parked motorbikes sending them crashing onto the pathway where the monk was walking. The novice monk seen in the footage, Phaiwan Dasanthat, 19, is currently studying at the Cherng Talay Temple prior to being ordained. Mr Phaiwan said, “I have just found out that the CCTV footage of the incident has gone viral on social media. I believe I survived this incident because I was of a conscious mind when I was walking along the road. “I was walking along Srisoonthorn Rd near the Cherng Talay fresh market collecting alms on Saturday morning (June 24) when a red Toyota hit a salaeng (motorbike with sidecar) forcing me to jump out of the way. The car then hit another motorbike parked on the side of the road. “The red Toyota sped away towards Heroines Monument. “I was very panicked by the incident as i could have been injured if I did not get out of the way dso soon,” Mr Phaiwan explained. “Soon after the owner of the motorbike turned up to find his motorbike totally damaged. He said he was going to report the incident to police. Luckily there were no people injured,” he added. Lucky novice monk. Wow! Must have been a scary experience. The Abbot said:.."novice monks and members of the general public could be killed,.... etc, etc." Does the Abbot not know that daily people get killed by other peoples reckless driving, regardless their status?